2nd day with the Ironman Master. Did my regular commute with it this morning. The first couple miles into my commute was so sweet, I had to pull over on the side of the road, and call in that I would be late for work!! The Ironman Master was showing me how smooth, fast, and agil it was.. I couldn't believe it! I am all for downtube shifters. They are on all my bikes except my Lightspeed. I was a little skeptical at first about the brifters in looks and feel! Well, a 30 mile shakedown ride CONVINCED me, the brifters are in, the Ironman rides better and smoother than anything in my stable(see sig)except the 96 Litespeed Classic. BTW, I caught a flat in the front tire on the ride too. But, low and behold, there was a spare tube in the seat bag and I had my mini pump in my back pack. Changed the tube, pumped up the tire, contiuned my shakedown ride. My ratings of the 89 Ironman Master on a scale of 1 to 10, with 10 being excellent, I give it a 20!! 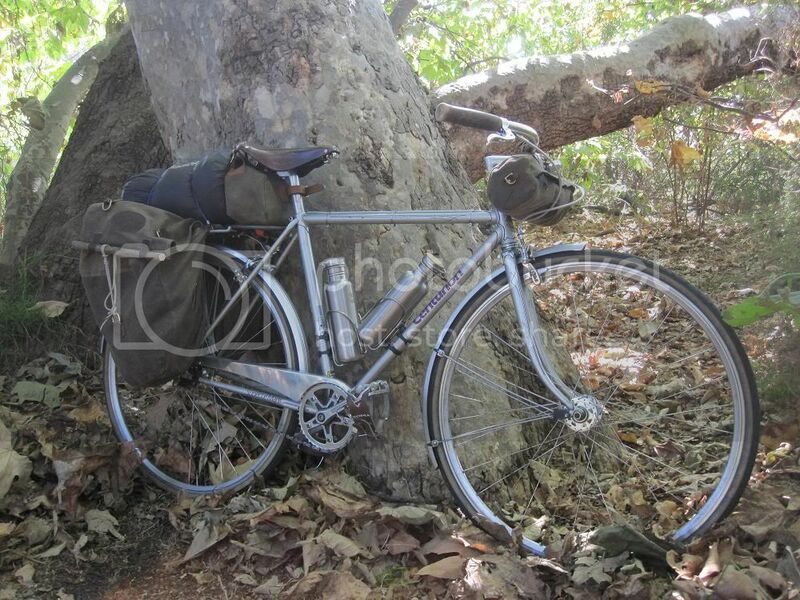 here's my Centurion super lemans which I converted into a single speed townie & occasionally use for light touring. Im guessing its from 1981, serial number is N1E5788, very happy with this bike and ride it often. Going on a 30 to 50 mile trail ride tomorrow. Couldn't decide on which bike to ride, the Ironman Master or the Litespeed Classic. I took a quick two mile ride to see which felt the best. That was tough. The Litespeed is flawless, however, the Master is super smooth and had one thing better than the Classic!! Even though the Classic was fitted to me, and the Master has just been roughly adjusted by me, the Master felt more comfortable. Also, since I commute a lot, and all my bikes have toe clips, I feel more comfortable with toe clips, which the Master has. Some kind of way, the slopping seat on the master fits my crouch riding well. I tried to make the seat on the Litespeed tip down a little, but couldn't find the adjustment to do that, if there was one. I am taking the Master. But, to be fair, the next time I will take the Litespeed over the same route, and see what gives. Also, I need to find out how to adjust that seat on the Litespeed. 1984 Centurion Turbo. Had to re-do because it was rough. Heads-up on the eBay bike by afilado. Encouragement from ggl205 and Chicago Al. Preliminary heavy lifting on the decals by AZORCH. Bar/stem from mazdaspeed. Some other C&V BF member recommended the Jagwire Racer cable/housing system, and I thank that person. drrobwave traded me the wheels and sold me the calipers. Several BF members took the take-offs in trades. The Colonel and CV-6 contributed other calipers, but the blancos won the bid after I hung them. BF member delicious advocated stripping the frame and painting what wasn't polished, so I did. Moral support from JunkYardBike and A.Winthrop. Immoral support from txvintage. 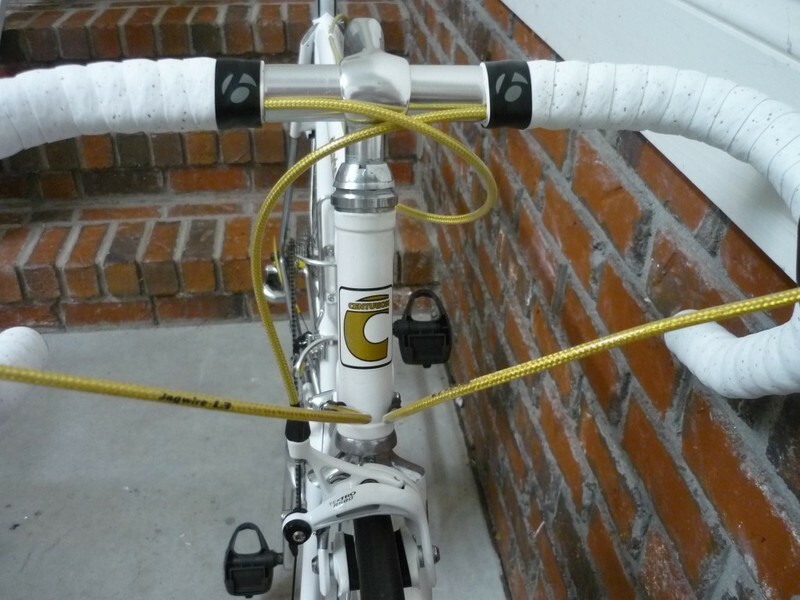 The headtube was nice enough, in front, to have left chrome, but the rear wasn't. Decals by JR at VeloCals, and it was his suggestion to "go gold." 3 weeks from "idea" to delivered product. My local powdercoater handled that part, made an error and re-did it. He's not a bike guy, he's a coater. As a result, I actually had to file out the inside of the top tube cable guides to get the housing to fit. I also had to use old BB cups to re-fresh a thread track for the BB, and I had to file down the DT braze-ons. Installing the headset cups could have been easier without powder coat in there. The decal areas were wet-sanded and clear-coated after the decals were applied. I did not clear the entire frame, or even the entire coated area. EDIT: drrobwave suggested the gold stripe to transition from the thick PC to the chrome stays. Tange 1 chrome frame and fork, 56cm. Tange Aero headset. Ultegra 9sp BB and crankset, hubs, SRAM cassette. Sugino 27.0 OEM post, Bontrager Forma saddle, 3TTT stem/3TTT bars. Bontrager wrap, Look resin pedals, Jagwire Racer cables/housing. IRC Paperlight tires. I truly don't remember the rim types, but I like them. Elite Ciussi cages from eBay. I've bought 8 cages from the same guy. Last edited by RobbieTunes; 11-06-11 at 01:08 PM. 1984 Centurion Turbo. Had to re-do because it was rough. Decals by JR at VeloCals with help from AZORCH. Robbie sure is a hard act to follow! 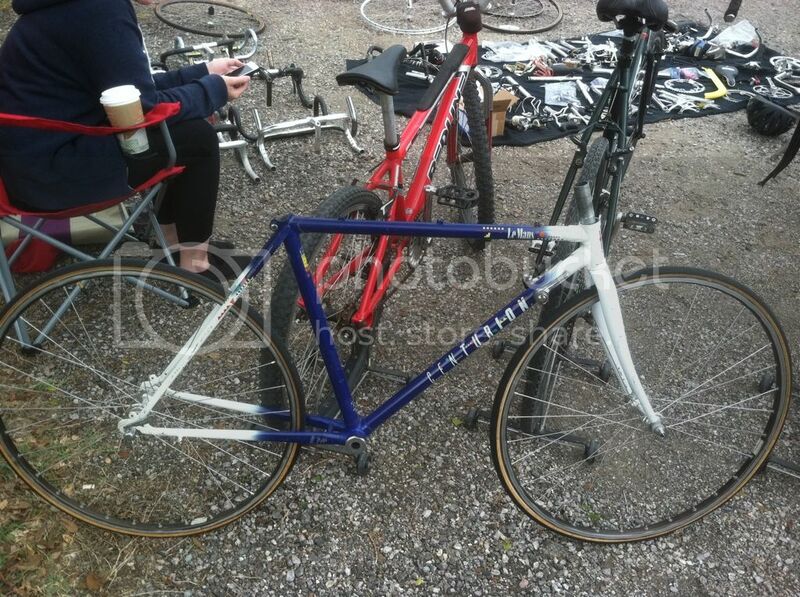 This is a pic of my '86 Ironman, 56cm frame, with original 600EX group. $Bay auction win from September (forgot to post pic). Good price, aside from shipping costs. Parts have been removed at this point for touch-up work and a re-build. Will post pics and a report when the build is complete. Superbad. Perfect positioning of the brake levers, IMO. Awesome job on the Lemans RS, xn7! Last edited by RobbieTunes; 11-09-11 at 09:13 PM. nice i've got an 89 IM master with the same paint... definitely a blast to ride! also loving that black/yellow Lemans..
Robbie, that Turbo looks amazing. I love the cable housing and component choice. We on the same page!! I am also loving that black and yellow Lemans, and anything Robbie puts out is thee chit!! BTW, my Ironman Master is Robbie's work! Right now, I am in the hunt for a red and/or black Master, will take an expert, but this Master has spoiled the dickens out of me.. I got it with me today at work!! I picked up this little guy today. Gonna get the serial number next time im over at the shed. Robbie sure is a hard act to follow! 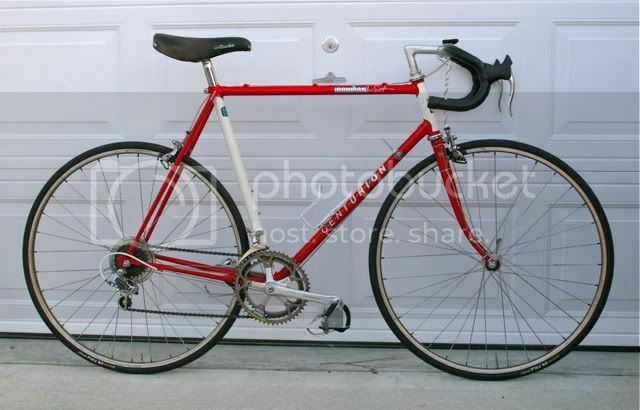 This is a pic of my '86 Ironman, 56cm frame, with original 600EX group. Don't be surprised if your rear derailleur shifter breaks; I just went through this and was told by A. Winthrope that this is a common occurrence. I love your turbo Robbie, and love what this thread has become. So much great centurion content and love. 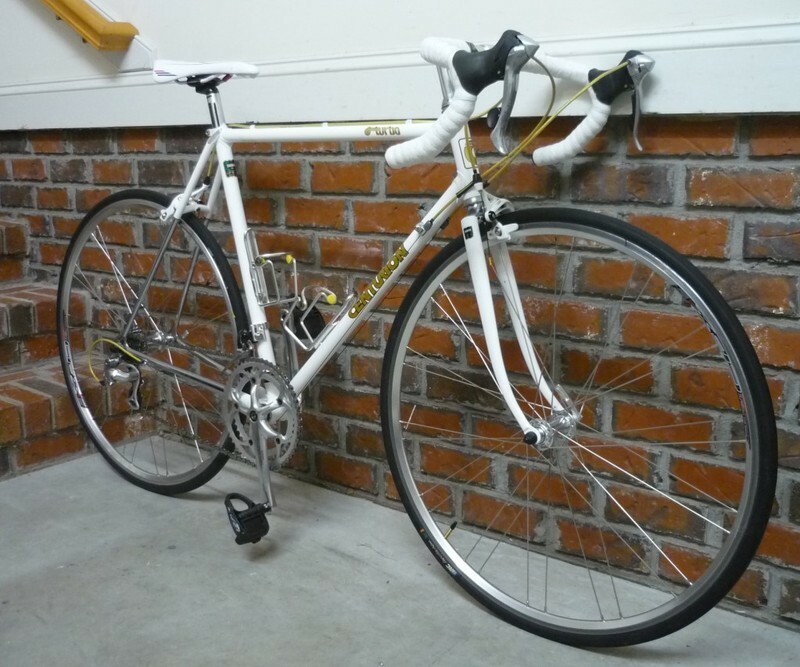 This is a picture of my daily commuter shortly after unpacking and reassembly. I found it on Craig's List in Arizona and gladly paid the $375 asking price. Comparing it with catalog OEM, it appears to be all original equipment with the exception of the rear rim, freewheel and rear derailleur. The original 40 spoke Suzue is replaced with a 36 spoke Kinlin. The freewheel is a Shimano 14 - 28 6 speed. The rear derailleur is a Shimano Deore XT. For my commute I outfitted it with a pair of Civia flat aluminum fenders from Niagara Bicycle Works. Using the format that T-Mar proposes, the following serial number, N3C0698, translates into the 698th frame made during the weeks of 5 - 6 in 1983. This bike is the perfect commuter for the hills and valleys around State College, Pa. This is a picture of my Sport DLX that I recently sold (replaced by the Pro Tour 15 listed in a previous thread). I purchased it new and it was my main ride until it's replacement with the Pro Tour 15. Serial #80703113. The frame was made in Taiwan. Seamed Tang Infinity,butted main tubes with Hi-Ten fork. Shimano AceraX derailler. Exage cranks. Weinmann wheels. Based on T-Mar's research on Sheldon Brown's site, I have it dated as a probable 1985. Which is about when I purchased it from The Ski Station, State College, Pa. Sometime in the late 1980s, Centurion / Diamondback started sourcing Taiwanese manufacturers for some of their lower level models. The format varies somewhat and I have a limited number of samples, but in all cases the first number appears to represent the year of manufacture. The serial numbers vary from 6 to 9 characters in length and may, or may not, include a letter as the first character." based on exage, "made in Taiwan", and also the decals. and those decals are from 1986+ bikes! Last edited by xn7; 11-24-11 at 02:46 PM. Thanks for the clarification. I completely missed most of the paragraph that you cited in my read. It doesn't look like proof reading is going to be a second career for me. Please take a look at N836792, my Ironman Expert. 23" ctr to ctr. I've been through the bike tip to tail, and I've tried to keep changes minimal. Tripped into it on a search for a Trek, and I was intrigued as I remembered Dave Scott from ABC's Wide World of Sports back in the day. Googled it, and I was impressed. All Suntour GPX, Araya CTL-370 wheels. Post #62, confuses me a bit, as it tells me it is a 1989, but the SN tells me 1988, and I understood that black was 1989 only. Please help me decode the id#. BTW, Thanks for all the interesting reading! Last edited by davez26; 11-24-11 at 08:09 PM. My wife hosted her old-time music group for a jam last weekend, and one of the players arrived on an interesting bike. I was not playing, but raking leaves in the parkway (in Chicago, the narrow strip of grass and trees between sidewalk and street) so had to take a look. 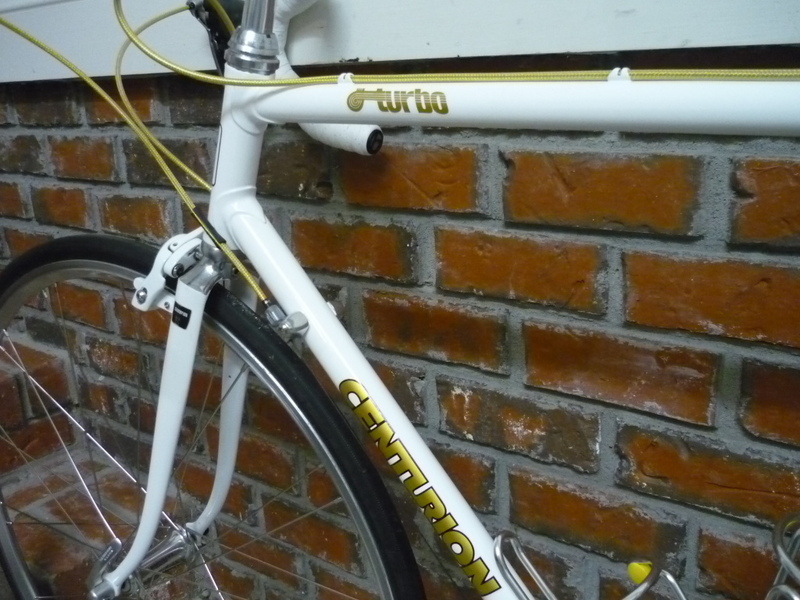 It was a late 70s ish Centurion Super LeMans, dated by the logos and elaborate lugs. Sorry, no photos. I didn't see the derailleurs but it had Suntour barcons, Weinmann center pull brakes; Sunshine hubs with I think Araya rims. It was scraped and rusty on the surface, actually so much so that it was pretty, but clearly still strong at heart. Got to talk with the owner as he left; he has had it for years and got it from the original owner, his ex-brother-in-law. Unfortunately he is a banjo player. Otherwise, nice bike with a great patina. It was likely produced in 1988 for the 1989 model year. Tons of bikes are sold for the Christmas season, so a 1989 Expert (as yours is) could easily be produced in a run done in 1988. 1989 was the only year Centurion offered black, the only year they offered Suntour GPX as a group, a change from the Shimano 105 they offered the year before. Suntour, previously the industry standard in friction shifting, was late to the indexed game and it cost them. It would be cool to have had a couple more years for Suntour to compete with Shimano on the indexing product, but it didn't happen. For 1989, Centurion reported to the cycling press that they had "tweaked" the geometry of the Ironman, but then didn't seem to get those figures to the press. As a result, it was speculated on, but never proven. Test riders hated the rock-hard Panaracer Technova II tires (700x18) that any geometry improvements were overshadowed by the absolute dislike for the tires. In fact, the tires caused the CTL-370 wheels to have to be trued more regularly than most. Once the magazine testers went to 23's and Loctite, the wheels stayed in true. Those who own/have owned several model don't generally notice a difference, especially among non-black Ironman models. However, some who have owned both a black '89 and other Ironman models, including '89 Masters, feel the black frame is a bit twitchy compared to the others. This could be purely psychological, of course. Every bike has a different ride, and if you tell me one is twitchy, I may convince myself of that. One noticeable difference for the '89 Expert is the use of 52/42 chainrings, while all other models came with 53/39. The GPX calipers were hidden-spring and very pretty, the shifters light and precise. Some didn't like the painted crank arms and hubs, but I saw one whose owner had stripped and polished, and it looked pretty ace. Thirdgenbird has a very nice '89 Expert, and I've had a couple. Excellent bike, glad you've got it, and welcome to the nuthouse.